For the beets: Preheat oven to 400°F. Wrap the beets in aluminum foil and place on a baking sheet. Bake until the tip of a sharp knife easily slides through the beets, about 45 minutes to 1 hour. Remove from the oven and let cool. Once cool enough to handle, use plastic gloves to peel the beets. Cut into bite size pieces. For candied walnuts: Combine the first four ingredients together in a large heavy skillet. Bring to a boil, whisking. Let boil 1 minute. Stir in walnuts, then toss until the syrup forms a glaze on the nuts, about 3 minutes. Transfer nuts to a foil covered cookie sheet and quickly separate nuts with forks. Let cool. Let stand at room temperature. Note: This can be made 2 hours ahead. For the citrus vinaigrette: In small bowl whisk together the first eight ingredients until well combined. Season with salt and pepper to taste. Cover until ready to use. For the salad: Divide the salad leaves equally among the plates. 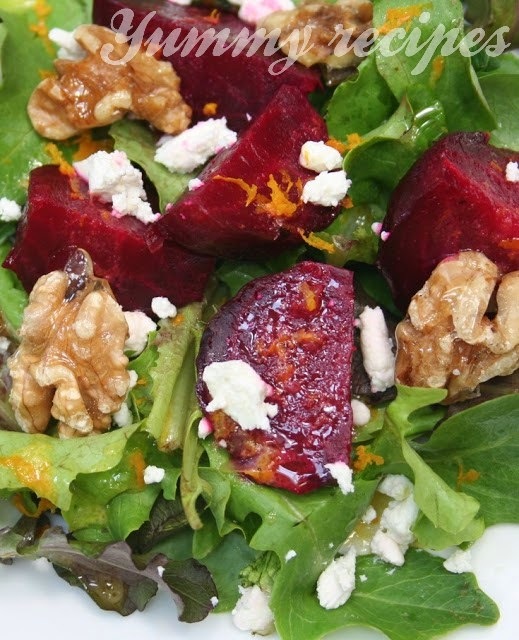 Top with the beets and then drizzle with the vinaigrette to taste. Crumble the goat cheese on top and garnish with candied walnuts and orange zest.